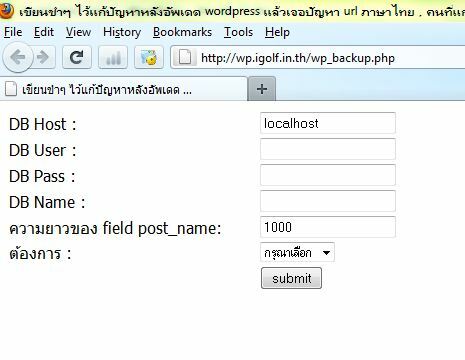 This entry was posted in How to and tagged cache, CentOS, DA, directadmin, varnish, varnish cache on 29/07/2011 by ไอกอล์ฟ. This entry was posted in How to and tagged CentOS, DA, directadmin, install da, install directadmin, ติดตั้ง da, ติดตั้ง directadmin on 26/07/2011 by ไอกอล์ฟ. This entry was posted in WordPress and tagged permalink ภาษาไทย, update wordpress, url ภาษาไทย, url ภาษาไทย มีปัญหา, url ไทย, wordpress url ภาษาไทย, wordpress url ไทย, wp url ภาษาไทย, wp url ไทย on 18/07/2011 by ไอกอล์ฟ.